Hello ... Hello ... my old friends ... It's great to see you once again! One of the many pleasures of being in the ELO [and related] universe is meeting fantastic folks as well as hearing music that truly caresses the ear drums. Last Sunday 14th November, Yours Truly KJS [and family] ventured up to The New Victoria Theatre in Stoke-on-Trent to witness another concert by the fantastic ELO Experience. It was a pleasure to me personally that Rebekah and James' first ever live gig was listening to these chaps and not to teenage manufactured pop star cardboard cut-outs ... or even Riff Pilchard! And we were not disappointed as this most accurate and professional of tribute bands belted out a large chunk of the ELO classics back catalogue with their wonderful cello ensemble in full effect! And this all despite Andy Louis' croaky throat. I didn't even notice that they omitted "Don't Walk Away" and "Big Wheels" from the set to protect his voice from those higher notes. It was such a great gig with some great guitar work from Jan Christiansen that seemingly fascinated James. The encore song of "Mr. Blue Sky" brought the whole audience to their feet and rounded off an ELOtastic night. 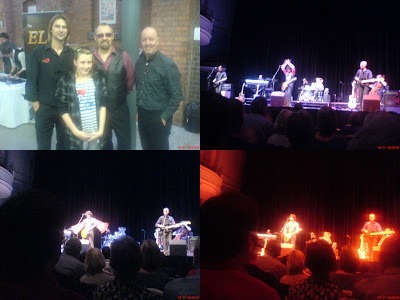 After gig, the band were just as obliging and talkative as they were at Shrewsbury back in July. Rebekah took great pleasure in garnering their autographs and meeting the band. I managed a chat and laugh or two with the group too. A measure of how honest this band is can be derived from the fact that Andy Louis told me that at 2 o'clock that afternoon the gig was likely to be cancelled due to his throat problems. But still the band overcame this hurdle ably to not only avoid letting down this family but also the audience.